Led Zeppelin's Indian fusion tracks Jump to media player Two Led Zeppelin songs recorded with Bollywood session musicians in the early seventies are being released for the first time. 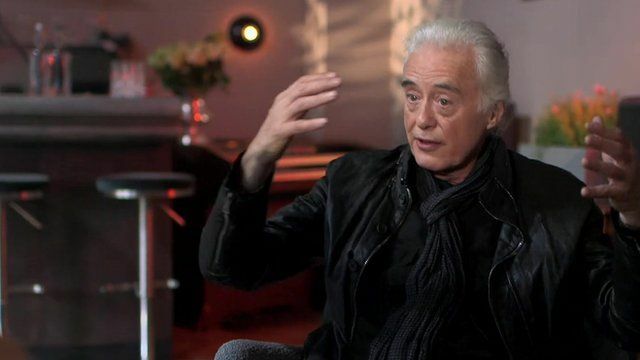 Reunion riff: Page on Led Zep Jump to media player Led Zeppelin's Jimmy Page talks to Gavin Esler about the 40th anniversary rerelease of Physical Graffiti. Jimmy Page: My life in photos Jump to media player Legendary rocker Jimmy Page has been reflecting on his life in music and talking about his photo archive. Jimmy Page: How we wrote Stairway Jump to media player As a re-mastered version of Led Zeppelin IV is released, guitarist Jimmy Page talks through how its anthem Stairway To Heaven was put together. Led Zeppelin's unheard work Jump to media player Legendary rock group Led Zeppelin have released two previously unheard recordings ahead of the reissue of the band's first three albums in June. Unheard Whole Lotta Love recording Jump to media player Legendary rock group Led Zeppelin have released two previously unheard recordings ahead of the reissue of the band's first three albums in June. Two Led Zeppelin songs recorded with Bollywood session musicians in the early seventies are being released for the first time. Guitarist Jimmy Page had visited India before, filming images of Mumbai life, but later he returned to explore the country's music. The songs, Friends and Four Hands, have emerged four decades later to appear on Led Zeppelin's remastered album Coda. Jimmy Page shares his memories of a "tricky" musical experiment - and a taste of the results.